Hello and welcome to another Hexie Linky Party (HeLP) for Hexie-aholics!!! Today I'm sharing progress on my Value Proposition project!! I'm prepping this post on Friday - by the end of lunch I'll be able to finish sewing these two together. 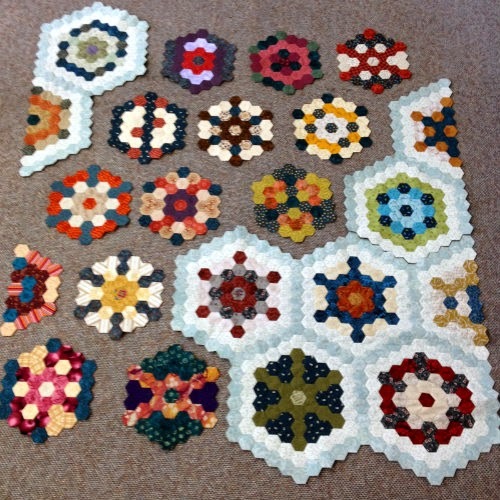 If you're just dying to see what the whole quilt will look like...here you go!! Incredibly out of focus but I didn't realize until I had picked them all up. Sorry! And now it's your turn! What are you working on?? We want to see your current projects, UFOs or dream projects. It can be hexies, kites, thirds, diamonds, whatever shape you want - we don't care - we just want to see it. LOL!! 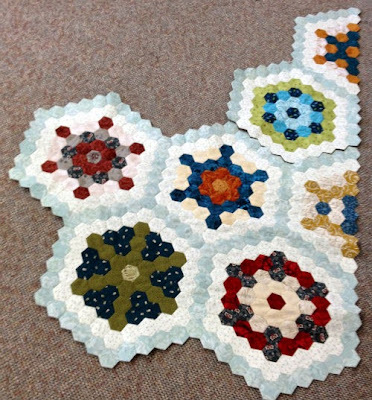 Thanks for linking up and Have a Hexie Day! It's looking great Sarah! The colors are so pretty. You are making wonderful progress. I love how bright and crisp your quilt is going to be. Beautiful. 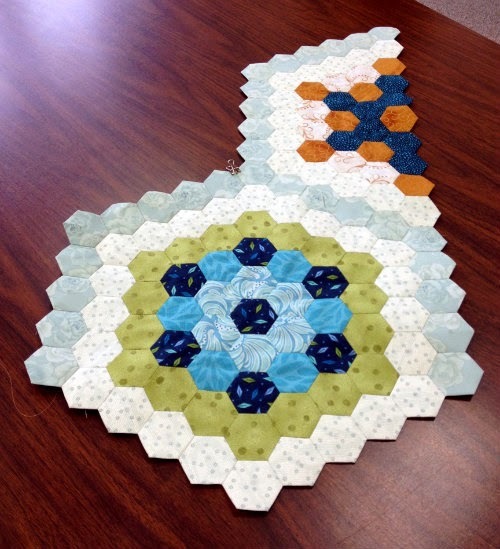 Your Value Proposition quilt is really coming along. It looks fabulous! I really love all of the blocks. That is looking so good, Sarah. Would totally overwhelm me, but I know you will make it happen! Well done, I'm not far behind you with the Value Prop motifs. Working on background and path these days!! Your color palette is so cheerful!